Living in a big city certainly has its perks. For one thing, there are literally hundreds of restaurants waiting to be discovered. Davao City is a treasure trove of all sorts of places to fulfill one’s thirst for gastronomic adventures. I’m starting to rediscover the city’s best-loved restaurants so here’s another story of my recent culinary find. March is my birthday month and I’ve always considered it my ‘cheat’ month. That means I get to eat whatever I want wherever I want the entire month. It was in this frame of mind that I brought my entire family to Zab’s Buffet Restaurant one Saturday to enjoy a night of good food and great company. I was planning to sing karaoke after dinner but that would be another story. Zabs Buffet Restaurant is pretty easy to locate; it’s close to the biggest university in the metro, Ateneo de Davao. The moment we entered the restaurant, we were greeted by smiling staff and mouthwatering smells coming from the plethora of food on the buffet table. So far, so good. We asked to be seated on a long table since there were seven of us. I would have to say the place is pretty cramped; there was hardly any room for everyone to move around without bumping one’s knee or toe on other guests’ seats. I also asked for two baby high chairs and was told that they only have one. I guess that’s minus one point for not being baby-friendly. But the food was exquisite. There was a salad bar where you can assemble your own veggies to make a Cesar or whatever you prefer. The appetizer selections were also great; I especially liked the ampalaya (bitter gourd) stuffed with meat and the crispy kangkong (river spinach). At the center of the buffet area was an island where chefs prepare fresh seafood, tacos and crepes. It was also where they served lechon kawali and roast beef. Rice was served along with a wide selection of dishes which were all delicious, especially the cream dory. Other selections included sushi, pizza and pasta. So yes, Zabs is a fusion restaurant; international favorites are given a unique Filipino taste and that’s what makes it popular among local foodies. What the kids liked best was the dessert station: it was filled with mini cakes, crème brulee and jello. They even have their own sundae maker sitting alongside a tray of sprinkles. Zabs Buffet costs P329 per person plus P50 for every can of soda. Not exactly cheap but the food and the service were definitely worth it, if not more. I would have to mention the waiters; they were exceptionally attentive. There was never a plate left on our table because they made it a point to clean up as soon as we’re done with one dish. Everyone was courteous and we left the restaurant with huge smiles. 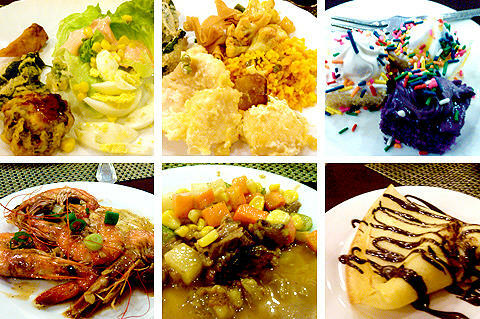 Zabs Buffet Restaurant is located in Paseo de Roxas, Roxas Avenue, Davao City. They welcome reservations and walk-in guests. I personally advise making reservations during weekends since the place tends of fill up pretty quickly.